Investment in renewable energy is rising, but clearly needs to grow faster to meet the goals for an expedited transition away from carbon infrastructure if we are to avoid dangerous climate change, given that now even the Trump administration forecasts a 7°C increase by 2100, which would be catastrophic. 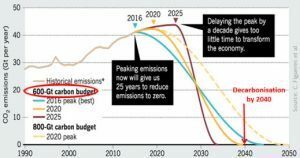 The Paris Agreement determined that in order to keep warming below 2°C, the global economy would need to be restricted to a 600 gigaton carbon “budget”, and completely decarbonize by 2040. However, only 4 out of 38 energy sectors, are on track with Paris targets according to the IEA monitoring tool published in May ’18. 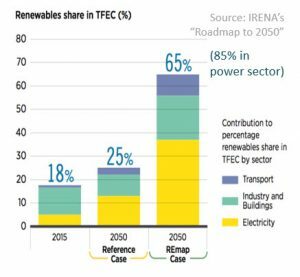 IRENA’s Global Energy Transition Roadmap to 2050 reported in April ’18 that the share of renewables would need to scale up rapidly to reach 65% contribution to Total Final Energy Consumption (TFEC) in order to meet the Paris targets, 260% faster than currently being implemented. New Climate Economy made the case that $90 trillion of Paris-congruent infrastructure investment by 2030 would yield a direct economic gain of $26 trillion more than business as usual. The UN’s Business & Sustainable Development Commission estimated $12tr in revenue & cost savings by 2030. 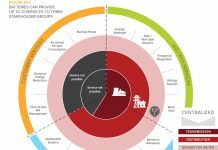 Rocky Mountain Institute, in its Reinventing Fire, projects $5tr in increased economic benefits from transition away from a high carbon economy. Whether the outlook is $26tr, $12tr, or $5tr, a consensus is converging to support the expectation that a transition to low carbon will produce substantial net gains, not economic hardship & hazard. 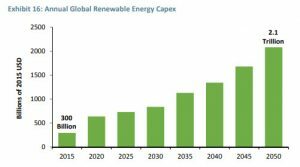 Jeremy Grantham estimates that global renewable energy Capex would needed to increase from current levels of $300B to $2.1 trillion per annum by 2050, which is approximately 6% increase annually. 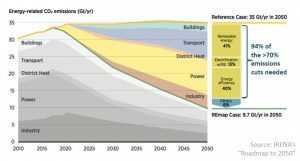 IEA estimated in 2010 that an additional $36 trillion in clean energy investment would be needed through 2050, averaging $1 trillion per year more than business as usual. Ceres agrees with IEA and considers that the “Clean $1 Trillion” needed is eminently feasible, across an array of asset classes in multiple sectors. Ceres, a non-profit organization that leads a national coalition of investors, environmental organizations and other public interest groups, coordinates the Investor Network on Climate Risk (INCR), a network of 130 institutional investors representing $17 trillion in assets committed to addressing the risks and seizing the opportunities resulting from climate change and other sustainability challenges. These reports demonstrate a general consensus that a rapid shift in investment in climate related infrastructure is necessary, but that unfortunately, sufficient investment is not being made, whether due to insufficient stimulation from statutory & regulatory policy, financial incentives or by NGO organized disclosure programs. Offshore funds that could be diverted to infrastructure by international cooperative enforcement and tax policies. Climate Policy Initiative also estimated that $1 trillion per annum investment will be needed to scale up from current investment totals in “climate finance” of around $380B (for reference, the total fossil fuel investment in 2016, was $825B). They find that although currently the participation of institutional funds is nominal, they are potentially one of the largest source of private sector capital. An earlier 2013 CPI study enumerated a total of $86 trillion in assets under management at institutions in OECD countries (as of 2010). Current levels of investment are less than $17B, or .02%. 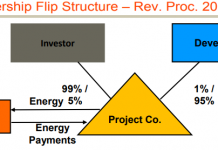 However, the potential scale of assets that could be available for renewable investments, even after applying various constraints, due to liquidity & diversification requirements and limitations on use of tax credits by tax-exempt funds, was approximately $700B in corporate securities, and $260B in direct project investment. With further proposed policy changes that could mitigate some of the constraints, and promote risk pooling, the resulting availability could be as high as $562B, or .65%, an increase of 3300% more than is being invested now. Pension funds and other institutional entities primarily hold investments in renewables indirectly through diversified infrastructure and natural resource funds. 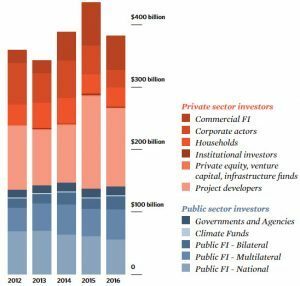 But increasingly, funds are making direct investments in operating assets and even direct investment in construction lending for projects, in part as a hedge to eroding returns from portfolio holdings of old carbon economy equities & bonds. 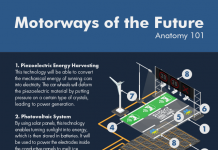 As CalPers noted, there is fierce competition among institutional investors for access to top-yielding investments in the alternative energy space. However, CALPERS and CALSTRS are now being compelled to disclose climate-related financial risk and alter their portfolios to include more low carbon economy holdings. Carbon Tracker, an NGO promoting carbon disclosure, as well as other entities promoting divestment, are adding pressure for shifts in investment policies. 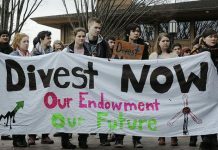 Increasingly, there is a boom in “ethical investment”, in ESG (environmental, social, governance) and fossil free ETFs and indices – MSCI lists 7 ESG indices, Thomson Reuters has 4, S&PDowJones offers a large family of sustainability indices, FTSE4Good has 7, ETF.com lists 78 socially responsible ETFs with $7.4B AUM, and ETFdb.com lists ETFs under 35 ESG themes, 10 of which are environmental. 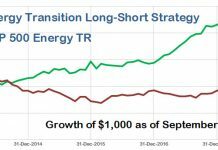 An interesting example is the advisory service FFI offering an Energy Transition Long-Short strategy benchmarked to their Fossil Free Index, which holds long positions in clean energy, advanced transportation, and smart grid companies, and short positions on reserve-owning fossil fuel companies, and is currently outperforming the S&P. As noted in an OECD study Role of Pension Funds in Financing Green Growth Initiatives (2011), renewable projects are mispriced due to policy bias favoring fossil fuel subsidies, that fails to adequately price carbon externalities, which depresses the relative returns, resulting in lower yields for renewable assets. In 2009 IAE estimated that subsidies for renewables vs. fossil fuels were $57B vs. $312B, focusing primarily on “explicit” subsidies. The IMF concluded in How Large Are Global Energy Subsidies? (2015), that by including “implicit” externalities, specifically health care costs and climate change effects, subsidies for carbon industries are actually as high as $5 Tr per year globally. Other studies find additional embedded subsidies, that include military defense of oil resource, sunk infrastructure costs, & opportunity costs, including costs of the Iraq war, adding $81B per year. Tax rates paid by US oil companies to foreign governments dropped from 70% to 45% after the ’91 gulf War, reflecting a “return on military protection”. An aggressive social cost of carbon policy, although a step in the right direction, would barely scratch the surface of these subsidies in aggregate. To the extent the OECD premise is correct, that the yield environment is distorted by subsidies for fossil fuels (coal, nat gas), nuclear generation and structurally embedded implicit externalities, a reasonable conclusion could be made that policies constraining fossil fuel subsidies could contribute to enhancing the competitiveness of yield from renewables, and in turn, unlock private sector institutional investment. Another argument: $31.5 trillion in wealth, 11.2% of the world’s total $280 trillion, is held by .003% of the population, the upper 1% owns 82% of all wealth, inequality is skew is an all time high. 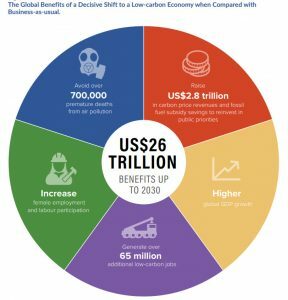 How much of this $31 trillion would the rich have to contribute in order to trigger the $8 trillion per year in sustainable global infrastructure? Only a tiny fraction because of their control of “triggerable capital” pools. At the One Planet climate summit in Paris Dec ’17, investment funds managing $26 trillion pledged to pressure the worst 100 companies responsible for 65% of all emissions. 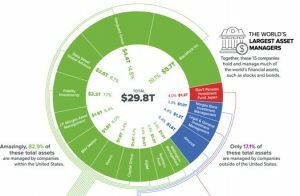 G20’s Taskforce on Climate related Financial Disclosure (TCFD) now includes over 500 firms with market caps of $7.9Tr, including 150 financial institutions managing assets over $100 trillion, including 20 of 30 systemically important banks and 8 of 10 of the largest asset managers. Another huge source of potential capital that could be tapped are funds in offshore tax haven accounts, which by some estimates are as high as $32 trillion. In a recently published academic study The Exorbitant tax Privilege co-authored by Gabriel Zucman (known for The Hidden Wealth of Nations), the authors make the case that $8 trillion has accumulated as foreign debt, which would normally result in an outflow from the US, but due to abnormally low tax rates for U.S. multinationals, money keeps flowing into US assets. A more concerted effort, including reform of US & UK Beneficial Ownership registries, & coordination of tax treaties to prevent transfer pricing strategies currently considered legal, funds in the trillions could potentially be made available to renewable infrastructure investment. 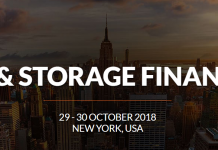 In conclusion, there is widening array of sources for asset financed project development, and institutional capital is waiting in the wings for policy changes that will moderate some of the constraints and recalibrate the current bias favoring yield from carbon investments toward a bias favoring renewable investments. The yield environment would shift dramatically, leveraging private sector institutional support, if Federal policy were to be more aggressive in enabling renewables as a means for withdrawing demand from fossil fuel assets and the need for associated military costs, adopt a carbon fee-and-dividend plan with properly valued social costs of carbon, and pursue a broad spectrum of climate change-related policy initiatives. Such measures would substantially tilt the balance away from implied oil subsidies, & would unlock a virtuous cycle of private sector capital across the full spectrum of climate change related investments & renewable energy development.